A saree is a 5 to 9-yard long draping material that is mostly worn by Indian women.Although it is prevalent in other Asian countries as well yet the concept of a saree originated in India. Unlike other parts of the world where women worn switched dresses in ancient times, women in India adorned their bodies with this long fabric that used to be draped. If you notice, draping is part of India culture from centuries. For instance, men’s bottoms were the ‘dhotis’ which were also draped. Coming to the saree, it is that ultimate jewel in a wardrobe that has been successful at accentuating a woman’s sensuality and at the same time adding edge to the overall appeal. This is the reason why saree finds a special place in every woman’s closet. Most of the Indian women, regardless of their age, love to depend on saree for all major events or traditional gatherings. And not forget, the longer the saree, the better is its final outcome. 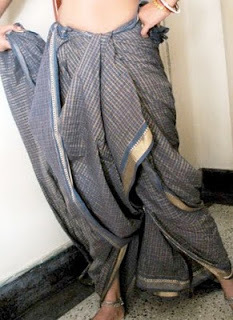 A longer saree is also suitable for Indian women with broad or medium frames. This is because a saree should have a good number of plates at the front, and a good number of pleats complemented with neat drape. Apart from that, a nine-yard saree can be draped in a plethora of styles such as Maharashtrian Kasta saree and South Indian Madisar style. Both resemble the similar dhoti style drape and are popular since time immemorial. 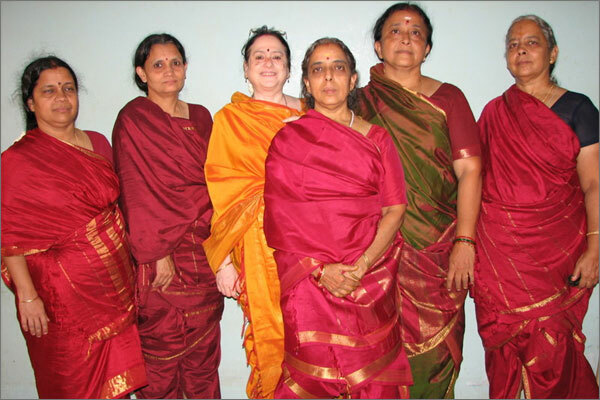 A nine-yard saree worn by women in Southern part of our country finds its mention in age-old traditions. This saree style, commonly called Madisar style saree is commonly worn by Iyers, Iyengars and Brahmins on the weddings. Unlike the quintessential nivi saree, this style is sensual as well as comfortable. The symbolic reason why women wore the Madisar sarees was to represent an ideal, holistic representation of both male and female elements in one body. This is the feminist explanation and shows women in strong light. In fact, Rani Lakshmibai who fought a war with the British wore a Madisar. The Best part about Madisar is that it relieves you from the hassles of wearing a petticoat; instead you can wear it without shorts or half pants. Begin wearing the trouser style saree by making approximately 3-inch plates from the non pallu end. Make note that the pleats should be at least 8 in number. The number of pleats can increase; depending on your body type. Women can make them up to 10 if they like. Take these pleats towards the left side of your body. So from the front, these pleats should be moving towards the left-hand side sliding under your left arms in order to reach your back. Tuck these pleats on the waist for your convenience.When you take the saree towards the left-hand side the wrong side of the saree will come up. It is important that the wrong side is revealing. (You will know why in the upcoming steps. Now take the leftover fabric towards your left-hand side by spinning the saree around your body from the right-hand side below your right hands towards your left-hand side. Be careful and do not disorganise the pleats. The uniform pleats must be carefully resting at its place. You can use safety pins if you want. Now make a knot with this loose end at the very centre i.e. near your navel. The loose end of the saree must now be tucked towards the right and the centre by spinning the saree around the waist once again. The long loose fabric now has to be flown between your legs from the front side of your body to the back. While pulling the fabric from the front side to the back, make sure you don’t disturb the plates or tucked in fabric, it must not come out.nWhen you take this fabric from beneath your legs, the wrong side of the saree which was showing after the second step will automatically mend. Now you re-rotate the saree to its original glory. Tipoff: A secret tip for keeping this fabric intact is to tightly grip the left and right side of saree under your toes or ankles. This will help you in keeping the saree fabric tucked in at its place. Now tuck this loose end towards at the right waist side, tracing the border of this saree from the right side of the waist to the left side through the front centre. Eventually, the loose fabric will be on the left hand side. Double check that the saree’s fabric is tightly tucked in. 7. Bring this fabric from the left side again to the right side. But now you need not tie it around the waist. Instead like usual nivi saree, the pallu end can now rest on your left hand shoulder. So this pallu end must come from the left hand waist side, through the back of the body, then flowing beneath your right arm and finally resting on the left shoulder. Tipoff: This complex draping and tucking would have messed up the border. So, one should adjust this border properly. Make sure that you check the border trail right from the beginning. A folded border will only hamper the overall finesse of the saree. Final words: The taller women can also use 10-yards saree for an authentic and cleaner appeal of a Madisar saree. While women with curvy body type can decrease the number of pleats (6-8 pleats) that one ties in the beginning to look slimmer. Lesser pleats will ensure that the saree carries less volume and rests on the women’s body better.